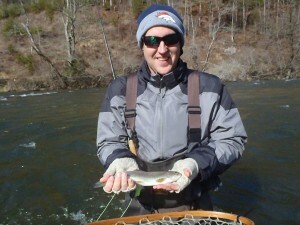 Tuckasegee River Fly Fishing Report | Hookers Fly Shop and Guide Service. Your Smokies Fly Fishing Experience. Yesterday, I had the pleasure of guiding William and Rusty on a half day wade trip on the Tuckasegee River Delayed Harvest. The generation schedule was not in our favor so we decided to stick around the South River Rd. area just above the island where it is still fairly easy to wade in high water. Both William and Rusty put a handful of fish in the net and hooked and missed several more. Most fish were taken on #8 Hot Head Marvins and #10 Fl. Yellow/Fl. Orange Extra Heavy Anvil Eggs fished under an indicator or Euro Style Nymphing. Almost every fish was pulled off the bottom. The delayed harvest section of the Tuckasegee is also part of the WNC Fly Fishing Trail. 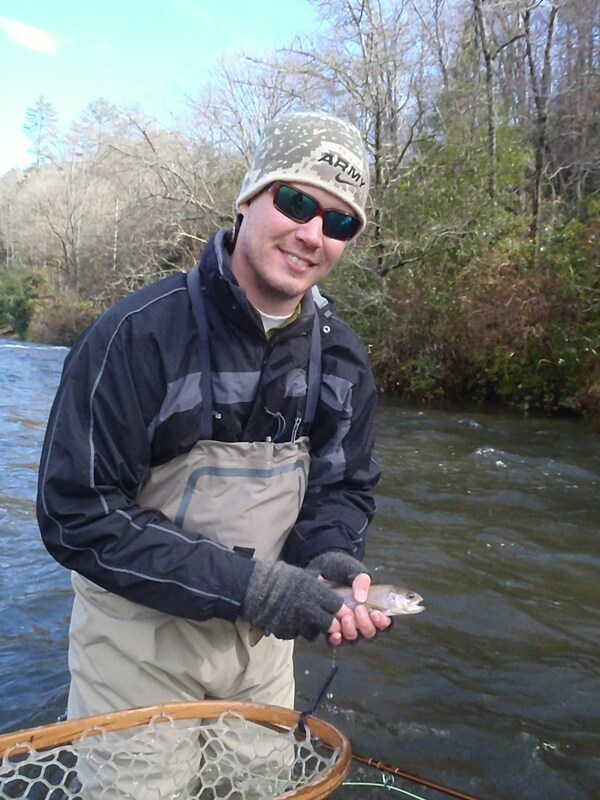 Click the link to read more on the WNC Fly Fishing Trail. Rusty with a nice catch. If you plan on wading this river during an East and/or West Fork release there are several wide sections of river that are not too difficult to wade. However, you should use extreme caution when wading in higher water. Click this link Duke Power on our home page to get the three day generation schedule for the East and West forks of the Tuckasegee.